Eddie C’s 2011 album Parts Unknown displayed his fondness for eclectic crate-digging and a flair for manipulating obscure, determinedly warm samples. The Canadian’s follow-up LP, released on both vinyl and CD, is lighter on the hook-laden samples and yet it is even broader in its scope, taking in all manner of downbeat sounds, be it instrumental hip hop, reggae, cosmic disco or jazzy house. Apart from the dreamlike synth work on ‘Drinkin & Thinkin’ (its rewound effects similar to Theo Parrish’s ‘The Rink’), the cutesy disco sensibility of Parts Unknown is replaced with a new sort of charm mined from a surfeit of unexpected influences. The sheer diversity of the record is reflected in its array of tempos: things start with a dubbed-out reggae vibe on ‘To Each Their Own’, albeit serving as an album intro rather than a sign of things to come; whilst jaunty Brazilian keyboards make an appearance towards the end. Country City Country’s only real constant is a low-end groove, each track weighted with the plod and rumble of rusty bass, rooted in the DJ’s love for twinkling instrumental hip-hop (most apparent on the languid roll of ‘Stoney Pharmacy’ or the blissful boom bap of ‘Fool On The Hill’). Two of the highlights ‘Every Life Under The Invisible Hands’ and ‘Jam On Dallas Road’ come from Eddie C’s teaming with Mike Roma (a previously unknown producer from little-known rock band The Electric Timber Co); a peculiar pair of boogie-house tracks imbued with a gentle, soft-rock guitar strut. 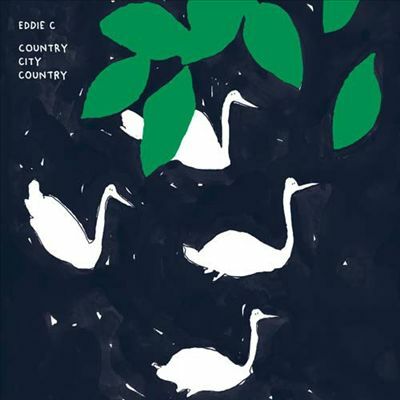 By Eddie C’s own admission, this is not a record assembled with the dancefloor in mind, and it is true Country City Country is best suited to easy listening. And yet there are moments that are bound to titillate dancefloors: such as the groovey ‘Every Life Under The Invisible Hands’; the jittery 808 drums and bass stomp of ‘Erase’; or the driving house workout of ‘(Be Aware) Nothing For Free’. This is by no mean the sort of album that will knock you off your socks on the first listen, but repeat listens will reveal a lovingly put together record, filled to the brim with dusty and diverse funk gems. great review, great record. fool on the hill is so good.